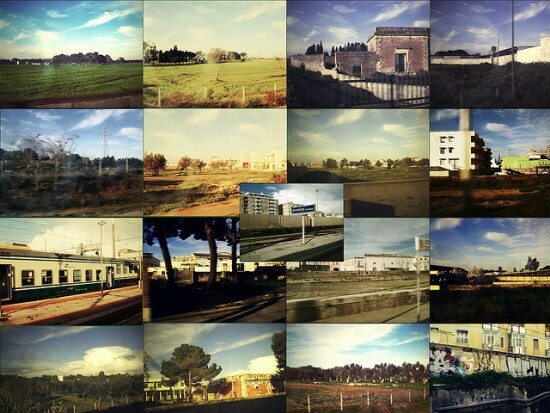 One of the best ways to travel through Puglia is by local train. If you want to get up close and personal with Italians and Italian culture, a journey by train will immerse you in the sights, sounds and smells of the local lifestyle. Tickets are inexpensive and easy to purchase right at the station, either from a clerk at the ticket counter or from a ticket machine. Despite the classic stereotype of Italian trains running notoriously late, things have changed and the rails have become a fast, comfortable and reliable way to get around. Stations are always located in the heart of town, so once you descend from the train, you are right where you want to be. 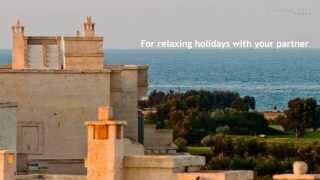 A pleasant summer train journey in Puglia starts in Bari and heads south to the cities of sun and culture. Before boarding your train at the station, be sure to hit the highlights of a day in Bari, all of which can be easily reached on foot. Your first stop should be in the old town. Wind your way through its tiny alleys, where you will see the locals living their daily life almost communally, with doors open, women making pasta in the doorways and lots of comings and goings. 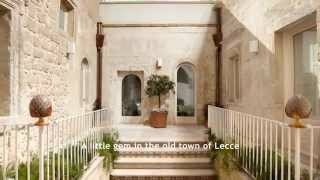 Between the heart of the Old Town and the sea is Bari's most famous church, the eleventh-century Romanesque Basilica di San Nicola. It is dedicated to St. Nicholas, also known as Santa Claus, and was specially built to house his remains, which still lie in the crypt. The lanes of Vecchia Bari nearest to the church are the most touristy, with lots of little souvenir shops. On the other side of the church is a pleasant walkway along the old town walls with views over a road to the sea: this is a nice stroll if the narrow lanes are making you feel claustrophobic. Bari's other great church is the Cattedrale di San Sabino, dating to the late 12th century. Close by is Bari's castle, the Castello Svevo ('Swabian Castle'), an imposing fortress by the sea which is open to the public. On the other side of the old town are a couple of pleasant interlocking public squares, Piazza del Ferrarese and Piazza Mercantile. This is a good place to stop for lunch or a drink, with a choice of restaurants and cafes with outside tables. A one-hour train ride (at the low cost of €5.20) will get you to Ostuni, the next stop on our itinerary. 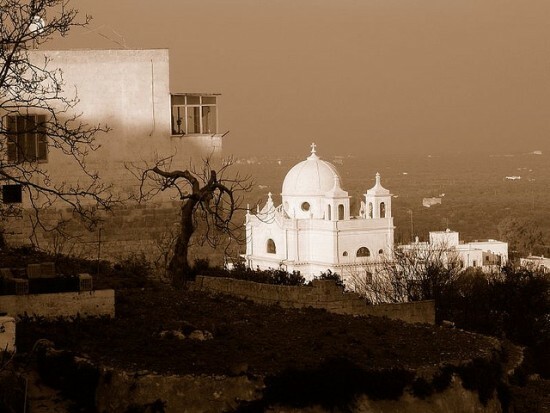 This hilltop town is an idyllic Puglian destination and just miles from the coast. It is commonly called the White City because of the whitewash on its buildings. The walled Old Town occupies the hill's top and houses its magnificent cathedral, definitely worth a visit. 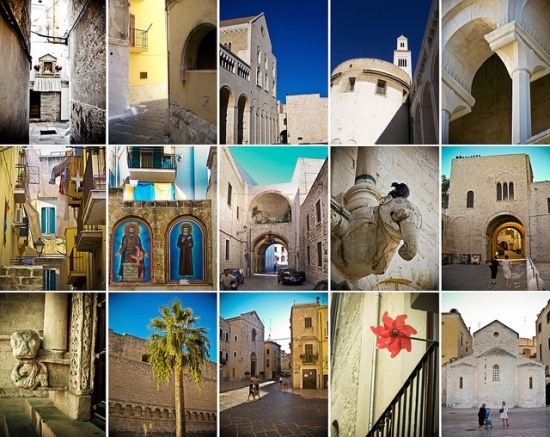 Ostuni is one of Puglia's top tourist destinations and its population swells from 30,000 year-round locals to 100,000 summer residents who come to enjoy the international ambiance and cultural opportunities. Don't miss the Osteria del Tempo Perso, one of the best and oldest restaurants located in the historical center of town. It is famous not only for its superb preparation of traditional local dishes, but also for its setting. It is built into a real natural grotto and has an oven which dates back to the 1500s. It also is home to a museum of peasant culture. 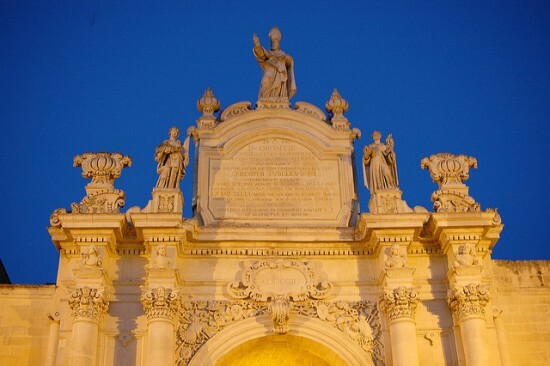 Another southbound hour by train (and another €5.20) and you arrive in Lecce, the Baroque capital of southern Italy. Head straight to Piazza Sant'Oronzo to see the St. Oronzo column and a 2nd century A.D. Roman amphitheater set right in the town center. Visit the nearby Castle of Carlo V, built in 1539. It is open to the public and entrance is free. To feel the full impact of the town's Baroque influence, don't miss the Basilica di Santa Croce, also located in the center of town. Don't leave Lecce without trying the traditional local pastry, the pasticciotto. A delicious selection can be found at Caffè Alvino, right in the heart of Piazza Sant'Oronzo. Have a look on our last posts, in case you've missed them! 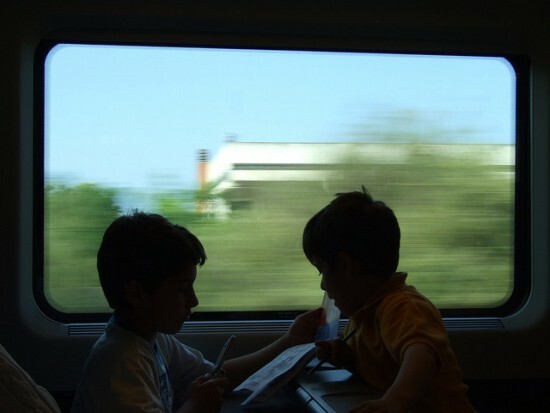 Discover how to travel by train train in Tuscany, Sardinia and Campania!